Nassim Nicholas Taleb is one of those rare thinkers who has the priceless ability to express complex ideas in ways that are immediately accessible and concrete. I’m going to shamelessly quote and derive from a very recent article he’s written in the Financial Times. It’s so good I’m going to take each one of the ten ideas he expresses and in turn try to link each one to underlying themes we see debated here over and over. 1. What is fragile should break early while it is still small. Nothing should ever become too big to fail. Evolution in economic life helps those with the maximum amount of hidden risks and hence the most fragile become the biggest. Taleb argues that random, high impact events occur more often than we imagine. Most of the time we expect the world to behave with a comfortable Gaussian range of behaviours, the mean being most common, and by the time we get several standard deviations out, the probabilities of extreme events becomes vanishingly rare. In fact the world is not like that. Seven years of good times, is one day replaced by seven years of famine. No matter how large and successful an enterprise was, no matter how comfortably and well you lived in the good times, if the famine causes the business to collapse, or you and your family to die… the good times mean nothing. Business failure in a corner dairy, or a local contractor’s ditch digging company is hurtful for the individuals involved, but does not damage society as a whole. People pick themselves up and life goes on. But when an entire financial system goes belly up, all at once…there is no ‘picking yourself up again’, because everyone else is in the same gutter with you. 1. It has allowed excessive concentration of wealth into fewer hands, inevitably resulting in the evolution of entities ‘too big to fail’. 2. It hides tranparent evaluation of real risks behind walls of ‘commercial confidentiality’, disinformation and lies which rewards cheaters and liars with a grossly disproportionate advantage. Entities built on this advantage may grow rapidly, but their inevitable collapse is even more spectacular. 3. Systemic failure becomes catastrophic because capitalism imposes an economic mono-culture on the entire globe ensnaring almost everyone in it’s grip. Local silos of prosperity and independence have been swept away by globalised, mass market business, creating a dependency model much like a addict becomes hooked on P.
4. Far from encouraging innovation and diversity that is adaptive in the face of radical change, capitalism acts to protect the established markets and the largest, most powerful players within them. Although some change is permitted around the margins, the core action in any market does not change unless and until the big dominating cartels allow it. What will change this? What form of regulation or law change is necessary to break this system? The end of the legal fiction that coporations are ‘natural persons’? The end of ‘intellectual property’? Nationalisation of all credit creation? The end of limited liability would be a good one. Make people take full personal responsibility for the risks they take. That would just hit the small players even harder when they try to muscle in, QtR. Legislating to remove things like hedge funds, demand corporate transparency standards, removing the legal fiction of “corporate persons”, and so on would all be very useful steps. Nationalising credit creation would reign in the banks, but it might also kill the boom times. If we’re willing to sacrifice that, fine, but I don’t see the whole world doing it at once. Small businesses like sole proprietors with unlimited liability? No it has been argued that businesses would become smaller if real free market policies like getting rid of limited liability were enacted. I agree, to an extent, but I like the idea of limited liability in situations where someone truly was just overconfident of their ability to run a business successfully. We should deal with people who shield corruption behind limited liability by making corrupt business practises as dangerous to careers in the private sector as they are in the public sector. I remember reading some article that said the cause of all the financial bubbles of the past 10-15 years basically stems from the fact that money is getting further and further concentrated among a small amount of super rich people and businesses. This is particularly the case in the USA. If you think about it, the super-rich literally can’t spend all their money so they invest it – in technology stocks, in the sharemarket, in oil, in derivatives or in housing. There’s more money invested in those areas than should be, so you get a bubble created – which of course eventually pops. If the money was spread out a lot more, then it would be spent (creating jobs) rather than invested in over-inflated market derivatives, or whatever you want to call it. This would be a more sustainable way for a country to operate, with the money flowing around a lot more and reaching a lot more people. It’s a kind of win-win situation for everyone (except the super-duper rich). We avoid market bubbles, we help out those in need to a greater extent and we create more jobs than ever. It’s something the left should be pointing out I think. A pity most economists are right-wing. Too big to fail? But they have failed. Its catastrophic because instead of them suffering its us who suffer. The big banks only survive because our future wage increases and taxes are mortgaged to bail them out. Jarbury is right. We owe them nothing. In fact they owe us centuries of backwages as poet ARD Fairburn once put it. But to do this we have to nationalise the central banks and put them under the control of those who work. Then nationalise all the key sectors of the economy with no compensation to the Jennings of this world. I would like to disproportionately misrepresent that tycoon. Then we have to devise how to run a democratic state to make sure the credit is used to produce things we need. For those of us in Auckland, stopping the banksters from supersizing our city would be a trial run. limited liability is a myth QtR. Infused, you’re confused. Try telling the owners of leaky apartments who are chasing the millionaire developers that limited liability is a myth. I am sure they will be consoled and comforted with your understanding of the situation. I’d just like my case to get to court. It has been more than 4 years since we started forking out for fixing my apartment. I think you’re right about the normal distribution – in fact many economists are coming to realise that perhaps these things are better modelled with a t distribution, i.e. a normal one but with fatter tails. However, I think you’ve got the causality confused in terms of ‘too big to fail’ institutions. It’s the large institutions that subsequently create great wealth for their proprietors, rather than the other way around. Think about it – the bankers don’t earn their money in a vacuum and then pool it to create a bank. Rather, the bank grows, and correspondingly so does their pay. At least, that seems more intuitive to me. Some of your other claims seem a little suspect to me also. Absolutely right, the lot of you. “Too big to fail” is the ultimate, gobsmacking euphemism for the fact that “democracy” (that marvellous choice between two millionaires every three or four years) is indeed dead: a clear and unequivocal admission that the “finance industry” is more powerful than the most powerful government on earth. So much so, that that same govt is forced to shovel trillions of worker-created wealth down the throat of an “industry” that has produced precisely nothing (while millions die for want of cents): merely shuffled paper – (and to our local shame we inserted one of its greedy minions as our leader). And that tiny, bloated cabal – those cheerleaders of greed and obscene usury that led us to this point – still have the utter gall to claim our attention and ask that we take them seriously. But there’s a silver lining: just as those “stimulae” continue to look increasingly impotent, there’s a new, steady assertiveness stirring from the bottom. US wealth defeated the USSR, and the lesson was well learned. The savers and producers now hold the cards: their more advanced morality is now poised to ascend. Karl and JC were right: thanks to the net, the meek are slowly but surely demanding their just inheritance, and the dawn of the yuan (over the buck) is just the first milky light of a potential new day – the salubrious new contours of emancipation slowly taking shape in the minds of billions; once tasted, never to be relinquished. And how apt the timing: the moneychangers on their bikes to nowhere, and the world at Calvary’s summit. Shoulder to the boulder, brothers and sisters, the truth can never die if we all but work to reveal it. However, like Pat has said below, surely a large part of the answer is more democracy (in the genuine sense) not its death? Certainly it’s time for an end to the false choice between, as you put it, “two millionaires every three or four years” and between two parties who then toss a policy bone or two to the yapping minor parties nipping at their ankles. It’s time for people to have a genuine and ongoing input into decisions affecting their future and that of their fellows; it’s time for the creation of new governmental structures which permit that to occur; and it’s time for gross excesses of capitalism to be regulated the same way (e.g. shareholder approval of senior executive salary packages). But given your apparent eulogy to democracy and your (again, apparent) enthusiasm for a dictatorial regime that puts bullets into the backs of people’s heads, I’m left wondering just what it is you’re hoping will arise from mess?! No enthusiasm for dictatorial regimes, I assure you Rex (and yes, bullets do go in the back of heads – just as lethal injections go in veins elsewhere, along with illegal invasions, torture, secret vice-presidential death squads etc etc). But lots of enthusiasm for good intentions. What I hope to see arising from this mess is a widespread acceptance that “dog-eat-dog” has failed our species: and that “to each according to need” is a nobler, more edifying vision statement – irrespective of the undeniable difficulties in its implementation. In practical terms, nationalisation (or at least strict regulation) of the finance industry, the demise of the dollar as the world’s reserve currency, a more democratic global power balance, and a genuine, co-ordinated, War on Global Inequality. (highly ambitious I know, but so’s wee Johnny apparently – and so were calls for abolition, welfare, fem and gay rights etc etc once). Good thought provoking post, RL. The company failures that have the most impact, are those companies large enough to list on the stock markets for capital raising. 1. Productivity would improve as workers have more of a vested interest in the success of the company. 2. A worker’s personal investment wealth would grow with the success of the company. 3. It would encourage worker’s to want to have a longer career with a successful company. 4. It would encourage good ideas to be passed up from the factory floor. 5. As worker’s collective shareholding grows, they would have a stronger voice on the decisions,directions and governance of the company. 6. It would encourage earlier whistle-blowing from within, on things that are going wrong in the company. So I would like to see it made compulsory for all listed companies to include a reasonable portion a shares as part of every employee’s remuneration. Yes. I once worked for mid-sized California based corporate that did a genuine 10% profit share for all non-sales staff (who had their own performance based compensation). It worked exceedingly well. It meant that I knew that off every $1 I succeeded in putting onto the company’s bottom line, I got to keep 10c of it. Shareholding for all employees (not just the senior layer of execs) has merit, but as an idea in isolation I’m not so sure how effective it might be. Certainly it would not work in the current climate, most corporates are not ready to accept that as worker’s collective shareholding grows, they would have a stronger voice on the decisions,directions and governance of the company. You mean, of course, that the capitalists don’t want to give up their dictatorial power. In response to ak’s communist rant, this post is about how to improve the capitalist system, not getting rid of democracy. Democracy is not dead. 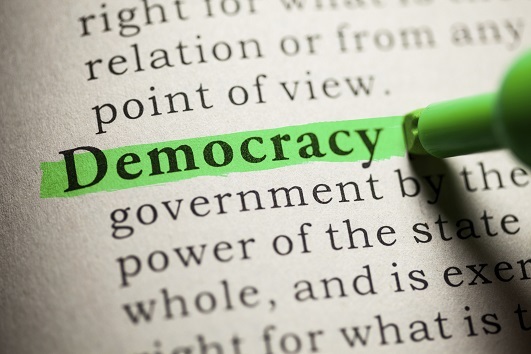 The world need’s more democracy, not less. I might be wrong, but I would have thought the vast majority of Standard readers would not advocate getting rid of democracy. ak can keep his Chinese new dawn all to himself. I do not look forward to the rise of China as the world’s biggest superpower. In fact, the two are diametrically opposed. Capitalism is, as a matter of fact, dictatorship. Communism requires participatory democracy and not the elected dictatorship that we have that is there solely to support the capitalists. Tom M – you should read Taleb’s books. T distribution won’t solve the problem either, the point is parametric models are wrong when you rely on historical descriptions of non-related events. LTCM wasn’t the first illustration, but it was the first big one (10 standard deviation move in 90 minutes of Danish mortgage bond spreads versus Euro swap spreads) – do the math. Taleb does get a bit repetitive but his core “we don’t live in a normal world” message is hard to fault. “We are seeing things that were 25-standard deviation events, several days in a row,” said David Viniar, CFO of the smartest financial firm in the world, Goldman Sachs. What are the odds of THAT happening………..
Did he not pass the equivalent of NCEA level 1 maths? 3. create derivative clearing houses, ie get rid of the otc market. And as always, you can’t spend your way out of debt. Nassim Nicholas Taleb claims that those who are putting society at risk are “no true statisticians”, merely people using statistics either without understanding them, or in a self-serving manner. Also bear in mind that all of China’s wealth was actually created by US demand. Domestic demand in China is not meaningful – they need the US export market. Look at what is happening now in China – in some of the new cities 80% of factories have closed, millions of workers are returning to their home villages where they have no access to land or jobs. China has managed to grow because of the pact the neo-Capitalist ruling party made – give up your political and human rights and in return we will guarantee prosperity. Lets see if they can keep that bargain. Well, lifting several hundred million from abject poverty is a pretty good start on that bargain I’d say goman – and funny, but those dire concerns you list don’t seem to matter too much to the average Jiu on the jyair-to. In fact the level of day-to-day freedoms, candour and optimism is quite striking (especially to the anti-PC brigade who marvel at such wonders as unrestricted smoking, lack of any apparent road rules, omnipresent hawking etc), and one wonders if the hobson’s choice we get every three years is really the sole route to utopia. Evidence to date is somewhat less than convincing…. And yes, the over-dependence on the US consumer certainly is untenable long-term. Which is precisely why the recent moves towards domestic stimulation and an alternative settling currency are being taken. Delicate position for the medium term, but a fundamental shift is softly occurring, the sheer numbers making it eventually inevitable. and quoth the raven….. removing limited liability would not hurt entrenched business interests it would only stifle the backbone of our economy – small and medium business. Started a business lately? I have and yes it has limited liability. I still have to provide a personal guarantee plus a charge over my house in order to satisfy the bank and the companies office. It certainly doesn’t feel like limited liability. You should ask yourself why the state should protect you from the full responsibility of your actions? and why the state should enforce a contractual arrangement on third parties that never consented to it? If there wasn’t state enforced limited liability you could still voluntarily agree to a limited liability contract with your creditiors, but that does not mean that that individual limited liability contract could be enforced on a third party protecting you from tort. Limited liability and corporate personhood are just schemes to privatise gains and socialise losses. If you don’t want to take full responsibility for the risks you take then don’t start a business. If you’ve read a lot of free market writings like I have you’ll find that those who argue for limited liability are the apologists for big business – the Randroids, the Mises worshippers and so on. Those who argue against it sympathise with the left. It has been argued time and again that without these protections we wouldn’t see such large corporations as we do now. Large corporations are not a product of the free market, they are a product of capitalism. There is a good article here to familiarise yourself with the issues: Is the Corporation a Free-Market Institution? A corporation that is compatible with natural law is no more than an association of natural persons, who agree to recognize the association as an artificial person “in its own right.’ However, as far as other persons are concerned, the existence of the association and its recognition by the partners as an independent artificial person in no way diminish the responsibility or the liability of the partners. How the partners assign responsibilities and liabilities among themselves is their business, but they lawfully cannot agree to deflect them to the artificial corporate person that they created. The partners own the corporation, and, as owners they are fully responsible and liable for what “it’ does. I cannot give lawful personality to my dog or my car and tell others that, when an accident happens, they should sue the dog or the car and leave me alone. In natural law, a corporation is just as much a means of human action as a dog, a car, or any other tool might be. There is another article here. Some interesting comments and all blind to a fundamental point. It was the market that spawned Capitalism and State Socialism. Neither State Socialism nor Capitalism have been able to manage the market. Both have been subject to its pitches, yaws and plunges. At the moment, the idea appears to be to save the management system ( Capitalism) and those who literally profit most from it. Other ideas seem to merely posit different management models….state socialism or whatever. Are we so far mired in the quasi religion of the market that we have forgotten that it is neither natural nor necessary: that it is a contrivance? Cut to the heart of the matter. Manage our political and economic affairs free from market imperatives. ie abolish it, rather than pretending it can somehow, someday be managed. Because it can’t. It is intrinsically unstable and unpredictable. It serves merely as a springboard ( a way and a means) for inadequate individuals who crave power over others. Dump it. It’s worth nothing. Has done no good. Never will. I was off line for a bit and found out recently that you have joined the Standardista’s writers team.